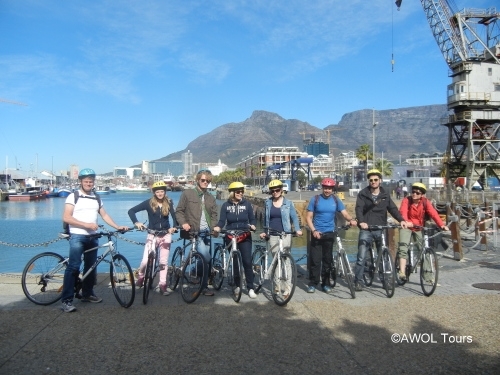 Let professional tour guides host you on a fun and educational Cape Town city cycle tour, showcasing the vibrant everyday life and history of the city and her people – a great way to introduce yourself to Cape Town at eye-level and get to know people and places naturally, all whilst watching your carbon footprint shrink! Our guided Cape Town city cycle tour combines the old and the new of Cape Town’s urban landscape, with visits to The Castle of Good Hope, Adderley Street, The Bo-Kaap, The Company Gardens, St. George’s Mall and Green Point. Learn about Cape Town’s heritage while you ride from the vibrant Waterfront to the bustling inner city, getting up close and personal with the city and its inhabitants. We visit the Green Point Stadium, the impressive newly built sports venue that co-hosted the 2010 FIFA World Cup. The newly landscaped Green Point Biodiversity Eco-Park is a must see for green enthusiasts and the Green Point Lighthouse happens to be the oldest working lighthouse in South Africa! Lead by experienced guides, our bicycle tours are relaxed and prove that cycling is the only way to truly experience this incredible city. Depart from : Outside the Information Centre at the V&A Waterfront on a regular basis and lasts for 3 hours (tours may be shortened or extended on request). (min 1 and max 10 guests) and are suitable for all ages and fitness levels.